This is not a new concept. 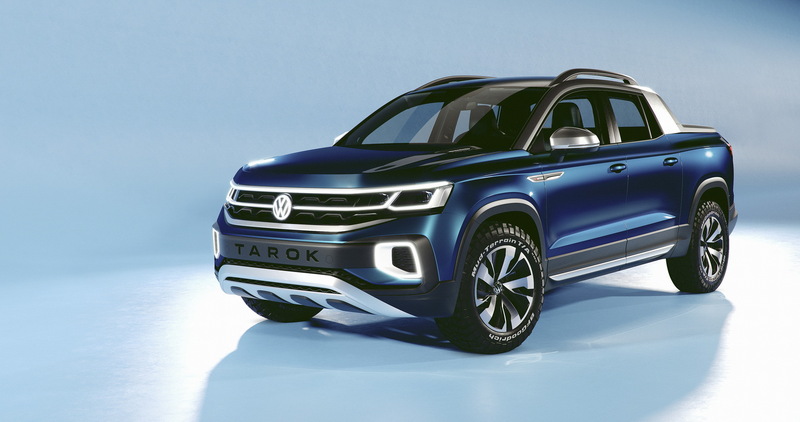 VW revealed the Tarok last year, but is bringing the "concept" (looks pretty production-ready to me) to New York to gauge reaction. The article above says the Tarok is a compact and not a new version of Tanoak (ugh, these names). In terms of size: "At 193.5-inches long and 72-inches wide, though, it is a little smaller than the 214.1×79.9-inch Tanoak concept." If I had more time I'd pull the sizes of other small pickups to compare, but today's not the day for that. 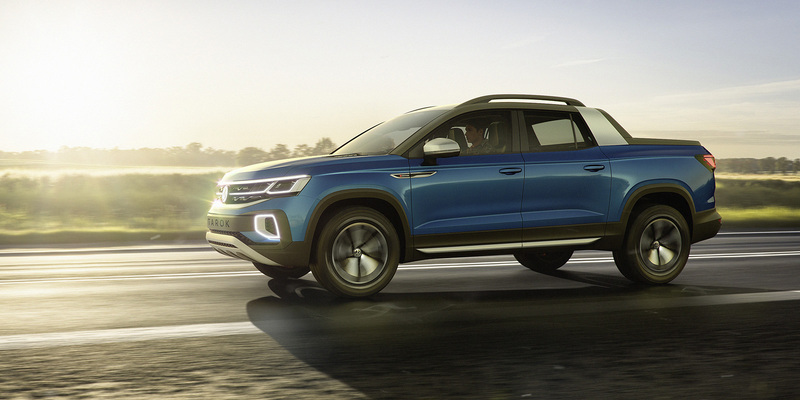 Looks like VW is getting serious about some kind of crossover based truck. 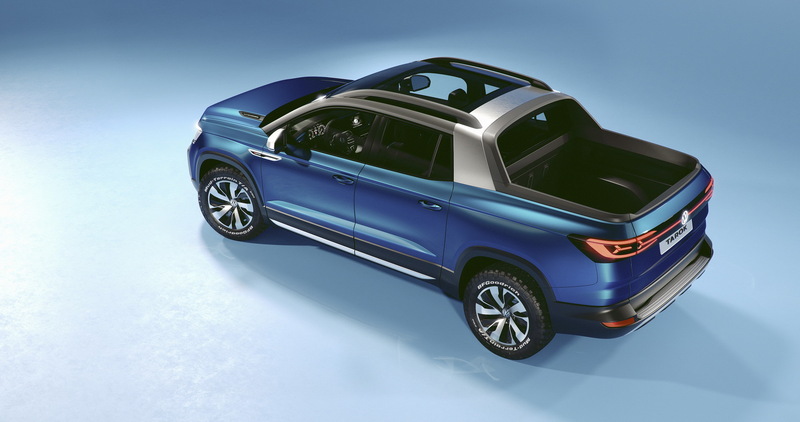 I wonder if they can successfully market something like this and the upcoming Ranger-based Amarok? Amarok with 3.0 V6 TDI please!! I prefer this to the Tanoak, size and looks wise. I wonder if they're exploring an MQB-based option so they can keep this in-house. Or they're literally just gauging reaction to see if a VW-badged truck of any kind is even an option for NA, or is it just for Europe. Yep, MQB-based. Routan was such a success here [/sarcasm] maybe they don't want to risk a similar issue with a Ford-based vehicle. Did the Ridgeline need competition for last place? If so, this one is a contender! I find it odd that they have 4+ year old generation BFGs on this thing... Also that they are MTs. There is no possible way that I could agree with you more. As a homeowner with 2 kids that makes random Ikea runs for furniture and trips to Home Depot for flowers & mulch these are literally the types of vehicles I am in the market for. However, with all the concept versions, I wonder who is going to actually pull the trigger and release one. Good. I hope these light bar grills stay as concepts. I really don't want to see cars lit up like Christmas trees. 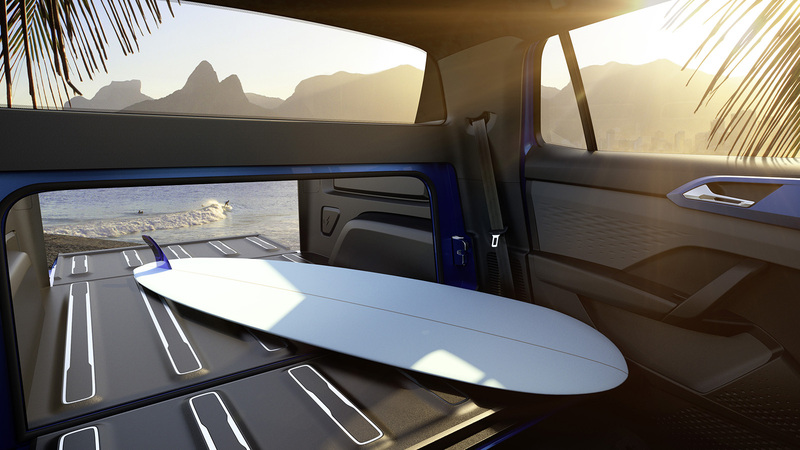 Excellent; I too live in a tropical paradise and need a truck bed pass-through in which to precariously load my surfboard. Jk, I actually think this is awesome. It looks really unsafe to me. The vehicle or the surfboard? With all the disclaimers they put on things these days I am legitimately surprised they published that. The sunroof/pass-thru cab seems like it could be reasonably safe to me; imagining it without the trim it's a bit like a roll cage. The pass through was like the best feature of the Avalanche and the Escalade EXT. Not exactly sure how this is unsafe either. The Subaru Baja had it as well and yeah, it's great, though better executed with the GM. Sure, it's a pain to drop the window in the Avalanche, but that's the only one that I know of that could do that. The Subaru and this concept can only drop the front of the bed and the glass stays where it is. With the Avalanche I was able to use it to move a riding mower, which wouldn't have been possible without it. That's true, although a pickup would tend to carry heavier cargo. This will likely have no significant improvement in GVWR over the passenger cars built on similar platforms. You can spec a new Jeep gladiator and a new jetta with nearly identical payloads.